Lois Pryce follows up her 2007 adventure book Lois on the loose with an epic journey through the heart of Africa. 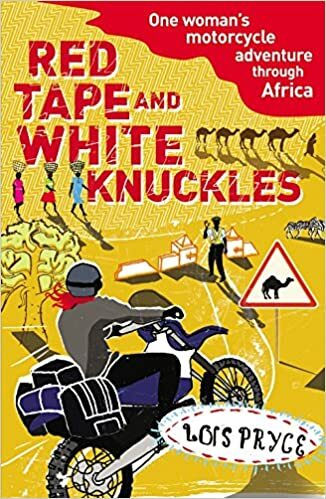 What makes this stand out a bit from other African overland crossings is that she has chosen not to go along either the west or east coast but rather through the more troubled regions of central Africa like Congo, DR Congo and Angola which to say the least makes things a bit more interesting for both the author and the reader. The fact that she's chosen to do this crossing despite suffering from extreme heatstroke from just a short stint in Morroco is either proof that she is incredibly dedicated or very foolish, even after reading I'm not really sure which to be honest. And apart from not choosing the obvious path she's doing this on a Yamaha TTR250 trail bike. Lois has her own quirky narrative style and shares her journey in a very enjoyable way and really doesn't hold anything back when it comes to sharing her inner thoughts and even prejudices (after all whether we admit it to ourselves or not we all have them). As she dedicates the narrative to mostly her thoughts and experiences along the way this might not be the most informative book if you're looking to read up in preparation for your own trip. Apart from the mention of an oil change there really isn't much in the book about the practicalities of motorcycle travel. I guess it's possible she got through the entire continent of Africa without so much as puncture but I think it's more likely that she's chosen to omit those parts because she'd rather tell her story. It is an immensely enjoyable read none the less.